Carefully labeling everything, I used a permanent marker to date and identify the items enclosed. I also bought several pounds of fresh, boneless, skinless chicken for other future meals. I divided each large family pack into 4 freezer bags with 4 chicken breasts in each. I always feel so accomplished when I have a productive day assembling meals that can be cooked with very little effort during the busy week. These delicious peppers were gobbled up quickly with a few left over for weekday lunches. I’m ready to relax and enjoy the rest of the weekend! Preheat oven to 350 degrees. Remove and discard the tops, seeds, and membranes of the bell peppers; set aside. In a large skillet over medium heat, cook the beef until evenly browned; drain. Mix in Italian seasoning, onion powder, garlic powder, diced tomatoes (with juice), seasoned rice package and 1 1/2 cups of water. Bring to a boil; cover and reduce heat to a simmer for 20-25 minutes to cook rice. Remove lid, turn off heat and let cool slightly. Spoon equal amounts of the mixture into each hollowed pepper. Fill a 13X9” baking dish with about 2”of water. Arrange peppers in a baking dish with the hollowed sides facing upward. Tightly cover dish with aluminum foil. Bake 35-40 minutes in the preheated oven, or until the peppers are slightly tender. Remove from oven, uncover and sprinkle each pepper with sharp cheddar cheese before serving. We’ve lived in our home for over 15 years, yet every time I make this recipe, I’m reminded of the day we moved our young family to our country home so many years ago. If my memory serves me correctly… My husband and I had moved a few basic items to our new home a few days prior to the “big” move that would take place on the weekend. On the morning of the “big” move, I made a large pot of sloppy joe meat in our new home kitchen before pouring it into a crockpot to be eaten later. I knew this would be a long day so I wanted to be sure to have plenty of food at the ready when our crew of movers finished up their job. After plugging in the crock pot, my husband and I headed back to our home in the city. There we were met by a fine group of young men that would take charge of the move. The company that we had hired employed a group of college students that were home for the summer and were trying to make a little money before returning to school in the fall. I have to say, these kids were awesome movers. They carefully wrapped furniture, lifted and carried an enormous load of boxes filled with everything from kitchen linens and cleaning supplies to garden tools and silverware. All of our heavy appliances were carefully loaded onto the trucks and carried across state lines to our new location. After a long drive, the cycle began again… The trucks were unloaded, hauling boxes, furniture and appliances into our new spacious home. The movers asked where we’d like things placed and willingly followed our directions as the sun fell from the sky and the crickets started to chirp. At the close of a long day of grueling work, I welcomed the group into our kitchen to share a meal. 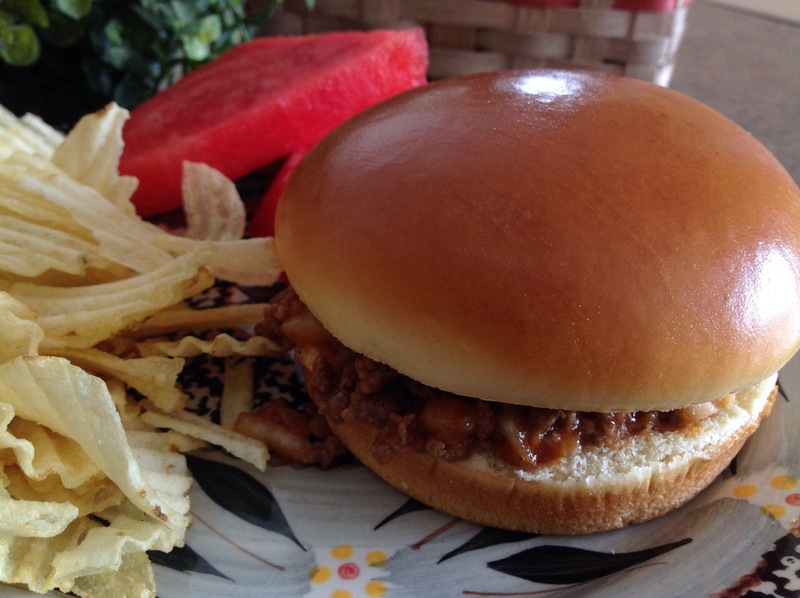 The guys scooped out oversized helping of sloppy joe and placed it on hearty brioche buns. A sprinkle of cheddar cheese completed the sandwich. Bags of chips, a crock of baked beans, and bowls of salad were wiped out in no time. 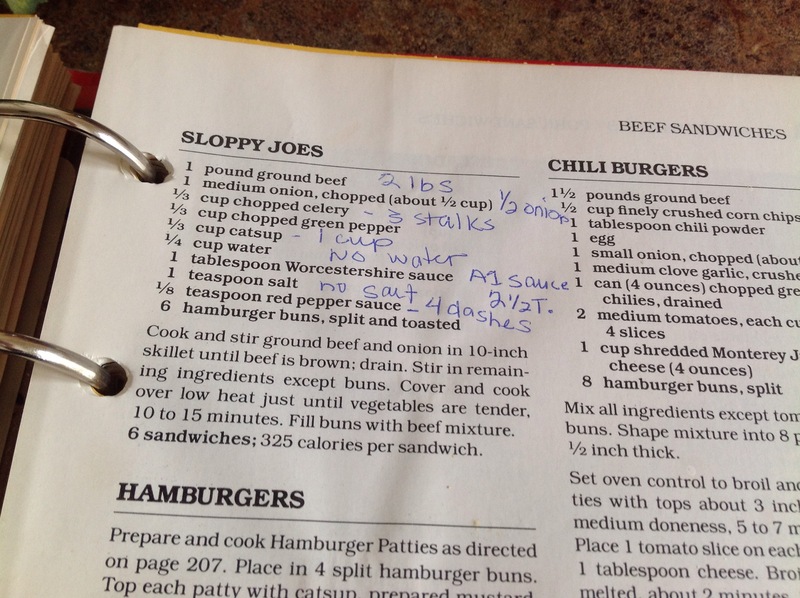 Before leaving, one of the young men asked for my sloppy joe recipe as he wanted to share it with his mother. He also asked if there was any more meat left in the crock pot for one last sandwich. I quickly scooped out the remaining mixture with a spatula and slathered it onto a roll. “One more for the road”, he said, as he gulped down the sandwich in a few quick bites. As the crew gathered up their belongings and headed for the trucks, my husband and I stood in the driveway and thanked them again for their hard work. The group happily patted their tummies and thanked us for the delicious meal. This group of movers made the day fun, exciting and stress-free. I’ll always be grateful for their hard work, cooperation and expertise. It was truly a pleasure sharing this special day with such a fine group of young men. Cook and stir ground beef and onion in skillet until brown; drain. Stir remaining ingredients, except buns. Cover and cook over low heat for an additional 15-30 minutes; just until vegetables are tender. Fill buns with meat mixture. Top with shredded cheddar cheese, if desired. My week began with a trip to urgent care as I woke on Monday with the symptoms of a bad flu. My chest felt heavy and I had a low hacking cough that shook my core every time it took a hold of me. After being diagnosed with an upper respiratory infection, I headed home with a supply of medication to help ease my discomfort. I knew that a bit of rest and a pot of piping hot chicken noodle soup would certainly help me find relief. 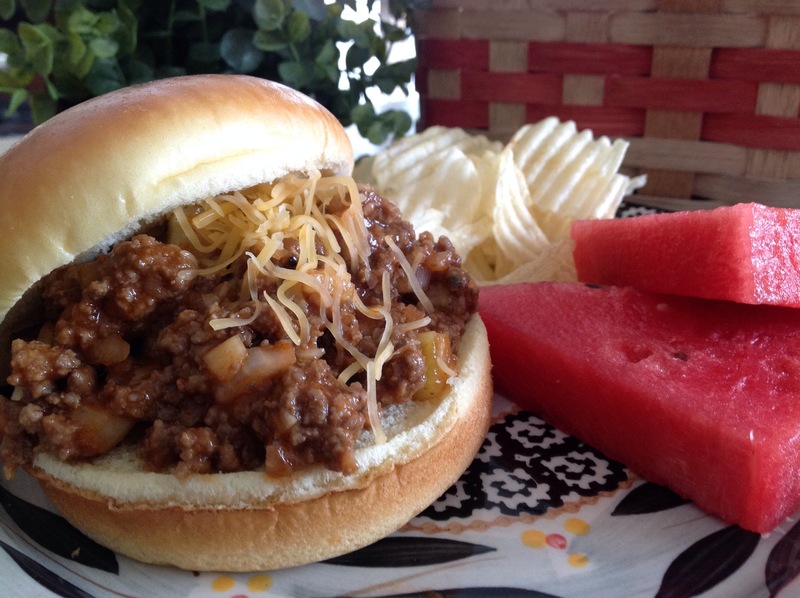 This is a quick and easy recipe that has become a family favorite over the years. Chunks of onion, carrot, celery and chicken make for a hearty base while the steaming hot broth warms the throat and nestles down into the tummy. Comfort food at its best. To save a bit of time, I often purchase a rotisserie chicken from the local grocer and shred up the juicy, well seasoned chicken before adding it to the broth. My favorite stock base to use is L.B. Jamison’s. I follow the directions on the back of the jar. Perfect every time… What a welcome recipe when you’re feeling under the weather. Heat water to boiling, add soup base. Reduce heat to simmer. Add carrots, celery, onions, pepper, garlic, and parsley. Simmer vegetables until tender. Add chicken and cook for an additional 10 minutes, stirring occasionally. Keep cooked noodles separate and add a small handful to each bowl of soup before serving. This keeps noodles al dente. ﻿ ﻿On a recent Saturday outing, my family and I stumbled upon a quaint new restaurant in the middle of our town square featuring Mexican cuisine. As we were seated in the festive dining room, a heaping basket of freshly made chips and salsa was delivered to the table. Looking over the extensive menu, I was excited to find a chicken dish that seemed fresh and flavorful with simple ingredients. I immediately requested the dish and continued to munch on the crispy chips and spicy salsa while listening to the sounds of the lively Mexican music streaming through the sound system. As we waited for our meal to arrive, we chatted about our desire to visit a local farmer’s market to find lots of fresh produce to make our own salsa when returning home for the day. Season chicken breasts with salt, pepper, and garlic powder. Bake or grill for 30-45 minutes or until internal temperature reaches 165 degrees. In the meantime, place ears of corn on outdoor grill or indoor grilling skillet, roast until tender. Slice corn off of the cob. Season to taste with butter and salt, if desired. In a microwave safe bowl, heat Queso Blanco Dip until warm and pourable. To serve, place a chicken breast on each plate, drizzle with Queso Blanco Dip and garnish with fresh cilantro. Next, add to the plate, a couple of heaping spoons of roasted corn, fresh salsa, and slices of avocado. Simple and delicious! Combine all the ingredients in a bowl. Cover tightly and refrigerate before serving. ﻿﻿We recently had a substantial amount of local beef delivered to our home. One of my colleagues owns a beef ranch and I decided to try the product that so many often rave about. The delivery came with a selection of cuts including various roasts, steaks, and ground beef. As I looked at all of the individually wrapped beef packages, I was reminded of a recipe that I first spotted in a community cookbook that I’m fond of. It’s an ole’ time recipe for homemade beef salami and the ingredients are few and common. I substituted Lawry’s seasoning salt for the “tender quick salt” just because I didn’t have any on hand. The beef salami turned out just fine. ﻿﻿﻿As the holiday weekend approaches, I thought this might be a fun recipe to try as I’m often assembling plates of appetizers when friends stop by and the kids open the fridge constantly looking for something to munch on. I keep extra loaves of frozen pizza dough on hand for this Easy Skillet Pizza. Using an old, well seasoned cast iron skillet is the secret to a crispy flavorful crust. Be creative and add your own vegetable favorites and toppings. Give this one a try… I think you’re family will love it. Preheat the oven to 400 degrees and grease the inside of a 12-inch cast-iron skillet with 2 tablespoons of olive oil. Place the pizza dough in the center and spread evenly across the bottom edge and 1 1/2 inches up the sides. Spread sauce, garlic, and oregano over crust. Sprinkle browned sausage evenly over the sauce. Add desired fresh, sliced vegetables and pepperoni, if desired. Next, add the mozzarella. Sprinkle the Italian seasonings on top. Finish with the Parmesan and drizzle with the remaining 2 tablespoons olive oil. Place the skillet pizza on the bottom rack of the oven and cook until the edge of the crust is golden brown and crusty, 30 to 40 minutes. Remove and let rest for 5 minutes before serving. Note: If the crust and toppings start to brown too quickly, cover with a piece of foil and continue baking until cooked through. Years ago, when our children were little, we used to hold an annual fall party for family and friends on our beautiful wooded lot. We’d elaborately decorate the barn and yard with hay bales and pumpkins, colored lights and corn stalks. I’d cook large pots of soup, chili, baked beans and bratwurst. A dessert table always displayed an abundance of tasty autumn treats to satisfy all of the guests. This cheeseburger soup was always a staple recipe made for the festive backyard party. I would double or triple the ingredients and separate the batch to freeze a portion in serving sized containers. This way, we had a supply on hand to enjoy during the cool autumn and winter months. In a large soup pot, brown beef; drain and set aside. In the same pot, sauté the onion, carrots, celery, basil and parsley in 1 tablespoon butter until vegetables are tender, about 10 minutes. Add the broth, potatoes and beef; bring to a boil. Reduce heat; cover and simmer for 10-12 minutes or until potatoes are tender. Meanwhile, in a small saucepan, melt remaining butter. Add flour; cook and stir for 3-5 minutes or until bubbly. Add to soup; bring to a boil. Cook and stir for 2 minutes. Reduce heat to low. Stir in the cheese, milk, salt and pepper; cook and stir until cheese melts. Tip: I make my own croutons to top the soup. Just cube a few slices of day old bread or leftover buns and sprinkle them with oil, garlic powder and salt (to taste). Bake in a 350 degree oven for 12-15 minutes or until crispy and golden brown. Cool; store in an airtight container. This is an adaptation of a recipe that I found in a Better Homes and Gardens magazine many years ago. I had received the magazine as a “free trial” but I rarely had time to read it as my 3 children were young and my life was busy. I did, however, make it a point to visit the recipe contest page to see what recipes had been selected as “winners” for each monthly issue. One month, a recipe for a white chicken lasagna was chosen. It was a bit more complicated than the adaptation I have submitted below. The white sauce was elaborate…starting with a classic roux. Managing a busy household, I had no time for that so I decided to use a purchased sauce. This eliminated a few time consuming steps and made for a quick and tasty alternative. It was a big hit in my household so I’ve been making it this way ever since. Preheat oven to 350 degrees. Grease a 9X13″ baking dish. Bring a large pot of lightly salted water to a boil. Add pasta and cook for 8 to 10 minutes or until al dente; drain. Cook broccoli according to package directions; drain well. In a medium bowl, combine cooked chicken, broccoli and one jar of Alfredo sauce, garlic powder, and pepper; stir together. In a separate bowl, beat egg into cottage cheese. Add Italian seasonings; stir well. Pour 1/3 of the jar of remaining Alfredo sauce in bottom of the pan, spread evenly. Place one layer of lasagna noodles, edges overlapping, into the baking dish. Pour 1/3 chicken, broccoli, and Alfredo sauce mixture over the noodle layer and spread evenly. Spread 1/3 cottage cheese mixture over chicken, broccoli, and Alfredo sauce mixture. Sprinkle 1/3 of the shredded mozzarella over chicken mixture. Continue to layer two more times, ending with a sprinkling of mozzarella cheese. Tightly cover with foil. Bake 30-35 minutes. Remove foil and continue to cook for 5-10 minutes until top is brown and bubbly.